With the special grill night buffet experience, the extensive selection of the buffet menu items is ready to welcome you with the premium ingredients of lamb chop, salmon steak, prawns, seabass and chicken at a price of IDR 588.000++ per person with the compliment rose for each guest. The Valentine dinner buffet will be also showcasing favourites that will impress your appetite from the appetizer and salad. Then, it continues to the main course with selection of mouth-watering dishes from local, Asian to Western delicacies including Japanese Station, Asian Wok Fried Seafood, Pasta & Carving Station, Chinese Barbecue Station, Live Crepe Suzette, Steak Diane Station and the authentic local food. Set on the Level 3, you can also opt for a dinner date at Sea Grain Restaurant & Bar. Mark the special day with the seven-course menu of handcrafted masterpieces prepared by Sea Grain Chef, Alvaro Utiel, incorporating his hand-picked premium ingredient with the rich flavor of Mediterranean cuisine. The seven-course menu is priced at IDR 998.000++ per couple including a set of Valentine gift, accompanied by the romantic tunes with an expansive Jakarta skyline view in the cozy restaurant ambience. Highlights of the Valentine’s menu include the signature of liquid explosion of green olives or what Chef called Magic Olives, Tuna Tartar, a deep-fried Seafood Bomb served with spicy American Sauce, Pickled Foie Gras, pan fried seabass served with spicy tomato sauce and roasted apple aioli, Wagyu rib eye served with beetroot mash and red wine sauce. Conclude the evening with sweet treat of highlighted dessert from Chef Alvaro. For more information, or to make a reservation, visit JakartaDiponegoro.DoubleTree.com or call +62(0)2131904433. For more news on DoubleTree by Hilton, visit news.doubletree.com. Sky Pool Bar & Café, OKU Japanese Restaurant, Paulaner Bräuhaus and Signatures Restaurant at Hotel Indonesia Kempinski Jakarta. If you’re the type of couple who loves to change places after you dine or listening to live band music without actually have to driving down to the other place, then visit Hotel Indonesia Kempinski Jakarta to enjoy all of that in just location. Located at the heart of Jakarta, enjoy the view of Jakarta’s skyline from the 17th floor of the Hotel Indonesia Kempinski Jakarta’s building with the Romantic Dinner package by Sky Pool Bar & Café. The four-course set menu will be paired with two glasses of wine at a price of IDR 2,100,000++/couple. If you prefer a Japanese menu for the Valentine’s day, OKU Japanese Restaurant offers you a seven-course Japanese delicacy specially specially prepared by Chef Kazuma Yazawa with cocktails included in the romantic, zen atmosphere of OKU. The dinner package is only available only on Valentine’s day. If you’re looking for a quiet dinner with cozy ambience, visit Signatures Restaurant at a price of IDR 999.000++/couple. A fan of beer? Paulaner Bräuhaus at the Hotel Indonesia Kempinski Jakarta has created Lovestruck Beer. Also, you can listen to Nu Page Band to pamper your heart and soul with all-time favourite romantic songs. In the celebration of the month of love, Fairmont Jakarta offers a range of romantic experiences to share with that special someone, from romantic culinary journey with candles, flowers and music to a luxurious stay package that are set to impress. The Romantic Escape package is available throughout the month of February with price starting from IDR 4,500,000++. Room reservations can be done by contacting the hotel directly at +62 (21) 2970 3333 or email reservations.jakarta@fairmont or at Fairmont Jakarta’s website. Food and love has always been an intricate story since time immemorial. For the ultimate in luxury, VIEW Restaurant offers an exclusive dining experience where the talented Chef Hans Christian will prepare a delightful 8-course menu featuring signature dishes including Foie PB & J (a delightful dish of foie gras, grapes, peanut and brioche); Allium Consommé (consists of sweetbread, daikon and leek), and Beef Cheek (served with yuzu kosho chimichurri, broccoli and barbeque sauce). 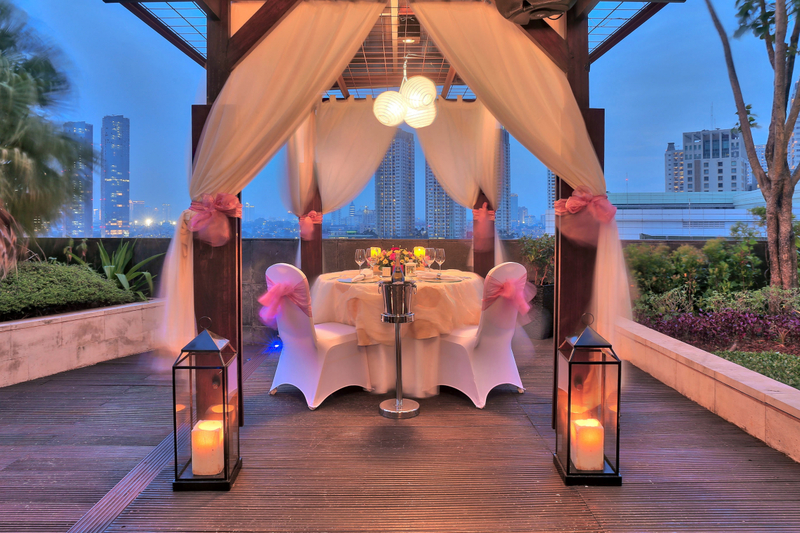 Guests will enjoy dinner with stunning backdrop of twinkling skyline, 22 floors above the city. Valentine’s Dinner at VIEW is priced at IDR 880,000++ per person. Indonesian fine-dining restaurant, 1945, is serving a six-course dinner. The menu consists of Warm Marinated Oyster with Foam of Champagne and Kemangi and Urchin Cream with green peas, sea cucumber and scallop to start. For main course, guests can enjoy Prawn Mantis with Sweet Soy Caviar and Dumpling of Tenggiri with bitter gourd, potato and peanut sauce, and Barongko Banana Panna Cotta to complete the evening. The romantic dinner at 1945 Restaurant is priced at IDR 888,000++ per person including a glass of wine. Indulge in an Italian feast with your special someone this Valentine’s Day with exquisite five-course dinner at Sapori Deli. The Italian set menu is priced at IDR 488,000++ including welcome drink and rose. Live music singer will also serenade guests throughout the night. The all-day-dining Spectrum restaurant is offering a romantic dining experience with extravagant buffet spread on Valentine’s Day. From fresh seafood, premium beef cuts to delicious dessert; couples can enjoy a wide array of International specialties in its buffet and open kitchen station. For a more private experience, choices of luxurious private dining rooms are available with advance reservation required. Dinner buffet at Spectrum is priced at IDR 1,288,000++ per couple including a glass of red or white wine. Prices are exclusive of 21% prevailing government tax and service charge. For more information or to make restaurant reservations, please call +62 (21) 2970 3333 or email diningreservations.jakarta@fairmont.com. Known for its desserts and opulent dining experiences, treat your loved ones to an intimate dinner at Lyon or Cinnamon restaurants in The Mandarin Oriental hotel, or express affection with The Mandarin Cake Shop’s limited edition “Shape of My Heart” Cake. Jakarta’s best French restaurant, Lyon, presents an exceptional six-course set menu specially crafted by Chef de Cuisine Edi Tan and his talented culinary team. The exclusive set menu comprises of Valentine specials such as Hamachi Carpaccio, Atlantic Monkfish, and the Paris- inspired Ispahan dessert – a delicate combination of raspberries, lychee, and roses. With a sophisticated environment, Lyon provides a perfect setting for an unforgettable Valentine’s Day dinner. The “La Vie Romantique’”dinner at Lyon is available on February 14, 2019, priced at IDR 2,988,000++ per couple, including a glass of Champagne or cocktail upon arrival. For more information or reservations, please contact Lyon at +62 (21) 2993 8824 or email to mojkt- lyon@mohg.com. Meanwhile, Cinnamon offers couples an amorous Valentine evening with its array of delectable international cuisine. Guests may enjoy chef’s specialties such as Salted Bake Barramundi, Chicken Fricassee, Sautéed Foie Gras, and selections of French artisan cheese in the restaurant’s warm atmosphere. The Valentine buffet at Cinnamon is available for dinner on February 14, 2019, priced at IDR 888,000++ per couple. For reservations, please contact +62 (21) 2993 8823 or email to mojkt-cinnamon@mohg.com. This year, The Mandarin Cake Shop will present the “Shape of My Heart”, a limited-edition Valentine cake, perfect as a gift of something sweet and special for your loved one. The heart- shaped cake is delightful blend of vanilla namelaka cream, raspberry and lychee. The “Shape of My Heart” cake is available with price starting from IDR 85,000+. To place orders, please contact +62 (21) 2993 8820 or email to mojkt-cakeshop@mohg.com. As classic and romantic as it can be, find a getaway package, as well as candlelit dinner at Alto Restaurant and Bar in Four Seasons Hotel Jakarta. “As they say, Italy is one of the most romantic countries in the world and you can sense the romance through our cuisine. I create my recipes based on that belief with deep passion for the ingredients.” says Executive Chef Marco Riva. Make the Valentine’s Day unforgettable with magnificent views of the city’s skyline where guests are invited to experience the most sublime Italian cuisine in Jakarta. Start the evening with a romantic sunset Aperitivo and continue with an exquisite seven-course dinner menu. Sip your favorite champagne, or trust the Four Season’s Sommelier’s recommendation, as you reminisce your love story. Sweet treats are always a hit on Valentine’s Day. Discover the sweetest creations at La Patisserie, from amazing chocolate pralines in exotic flavors, to a special Valentine’s cake – created for a true cream cheese lover. Lovebirds looking for a bit of extra romance can take advantage of a blissful getaway at Four Seasons Hotel Jakarta. Start the journey at The Spa, where the couple can unwind and enjoy a 60- minutes Aroma Therapy Couple Massage. Spend some time at Nautilus Bar for a pre-dinner cocktails with complimentary hors d’oeuvre, and head to 20th floor once ready for your candle lit dinner at Alto Restaurant and Bar, the final sweet touch to a day filled with indulgence. Breakfast is included that can be taken at the Palm Court or in the comfort of your very own Suite. Complete the experience with a lazy last day with extended late checkout until 4pm. Pamper yourself and your partner on the Valentine’s day with a rejuvenating spa escape at the Hotel’s full-service destination Spa, the ultimate urban sanctuary. Choose the Four Seasons highly recommended Double Indulgence – the two hour spa, a divinely indulgent treatment designed for two that welcomes you with your choice of a celebratory glass of champagne or our healthy juice of the day as you relax in a bath of bubbles. This treat of a treatment continues with a luxurious full body polish followed by a steam shower and finally your choice of massage. Then, finish the treatment with a complimentary wash and dry blow in Hair salon for a quick touch up. Take time to relax, recharge and reconnect in the most memorable way on a special day – or to make any day special. For more info and reservation please call +62-21 2277 1888 or send an instant message through Four Seasons Chat (Four Seasons App or Facebook Messenger). An accompaniment of free flow wine is available at Rp 280.000++/pax to complete your feast. Gia’s evening starts from 6PM on the 14th of February 2019 and is surely one not to be missed.